SAN DIEGO, Calif. /California Newswire/ — KING OF THA HILLS (K.O.T.H.) makes music business history with the release of their new hit single called "Aktive" which is now available on music outlets and is produced by multi-platinum producer Zaytoven (Xavior Dotson). 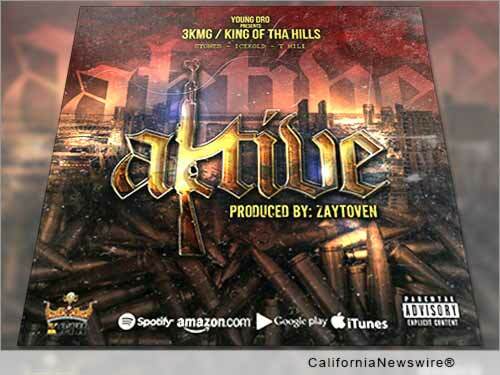 KING OF THA HILLS presents distinctive individuality with phrases like "In the streets I'm aktive." Combined with Zaytoven's Grammy award winning and industry leading trap sound, Aktive is undeniably one of the most original and exclusive songs to ever premiere out of both the San Diego region and the music industry. In recognition, KING OF THA HILLS artists Stones (Nijael Thomas), IceKold (Christopher Humphries), T-Mili (Ta'Ron Taylor), and Charlie (Tiras Thomas) have all made MTV/VH1 cameo appearances in platinum recording artist Young Dro's latest music videos for "We Be In The City" and "UGH." They have also collaborated with Young Dro and Charlie on a record titled "Pull Up." Independently, KING OF THA HILLS has contributed to the development of the San Diego music scene in creating a new wave of Hip Hop while establishing an indisputable eminence in the music industry. In lieu of all their present accomplishments, KING OF THA HILLS will be honored to showcase San Diego music talent on a modern day platform.